This is the third in a three-part series about Highway 12 in Utah. Click the links above to access the other installments. At 15 I committed one of the seven deadly sins of the National Park System by feeding the wildlife. Tucked away somewhere in a family photo album is a record of the transgression. I lie supine among rooty pine trees lining the park’s rim. Legs crossed at the ankles and hands behind my head, I crane my neck forward to watch chipmunks stuffing their cheek pouches with peanuts piled on my sternum. It’s my most vivid memory of Bryce Canyon, about 50 miles west of Escalante on Highway 12. Traveling west from Escalante, you wind through a pretty little chunk of Dixie National Forest. This stretch of roadway circles south, around Powell Point. Blink and you’ll miss Henrieville (pop. 223) and Cannonville (pop. 162), two small settlements that for some reason I like to imagine having a bitter 8-man football rivalry. Neither town has a high school, though. Instead, students from these communities commute a few miles down Highway 12 to Tropic (pop. 519). 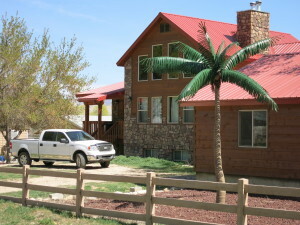 Tropic is a homey little hamlet set in the midst of a beautiful high-desert valley. As the crow flies, Bryce Canyon lies only a few miles west. To the east, the pink and yellow cliffs of Powell Point dominate the skyline. At sunset those cliffs star in an exquisite alpenglow light show. Tropic doesn’t have any beaches, but for those of a mind to search for it, there is a palm tree. Local lore suggests that the town’s name was proposed as a means to draw visitors from around the state to enjoy the produce grown on area farms. Most of the services in Tropic are right on Highway 12. Hotels, restaurants, and even a grocery store with fuel pumps and cheap soda refills queue along either side of the road. Only 10 miles west on Highway 12, Bryce Canyon National Park is the area’s main attraction. 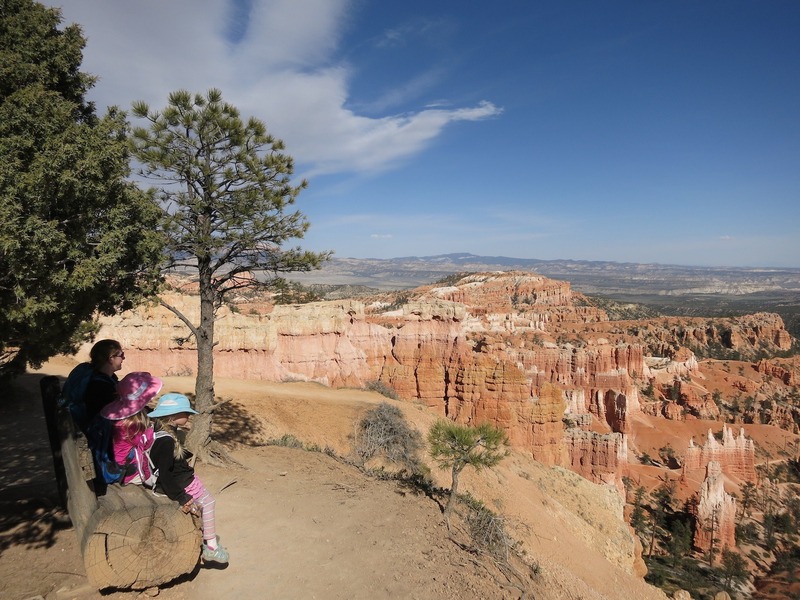 Bryce Canyon City is the traditional staging ground for park excursions, probably because it offers the closest accommodations, beginning right outside the park’s main gate. It’s a fine place to stay, but a little too homogenous for my liking. If you’re temporarily hanging your hat in Tropic, you’ll be glad you opted for the scenic drive out. 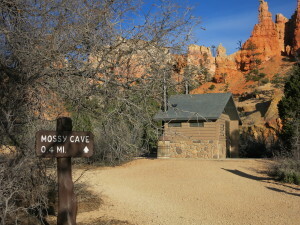 Mossy Cave– Mossy Cave is only 4 miles from Tropic, but technically inside the Bryce Canyon park boundary. A small parking lot with good signage and an NPS restroom mark the trailhead on the west side of Highway 12. After a quick .3-mile stroll, the trail splits. Left takes you to Mossy Cave. Even in dry seasons, water still seeps from from this natural grotto (0.4 mi. ), and cool air seems to swirl out like a soft breath. We almost skipped this site altogether, but our hotelier Merilee insisted it would be worth a stop on the way to the park. We are happy she did. It was a perfect warm-up for the rest of the day. (Pro Tip: Get there early. It bears repeating.) We had the trail to ourselves all morning, but when we got back to the parking lot (about 9am), it was nearly full of people just arriving and quickly becoming a zoo. 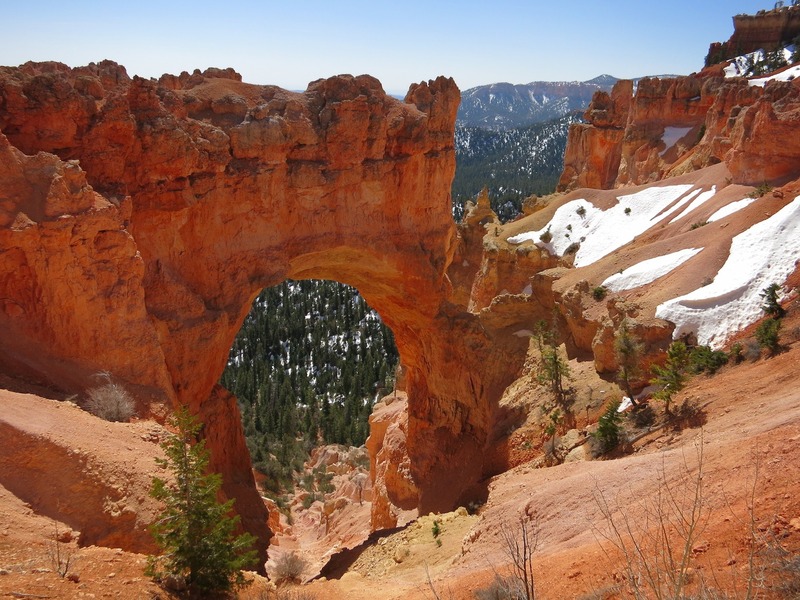 Hiking in BCNP– The trails in Bryce Canyon are incredible, and you can’t go wrong choosing any of them. Generations of hikers have worn down the soft limestone paths and weathered them nearly free of ankle-twisting surprises. The almost paved nature of these paths has resulted in an unintentional hazard, however. 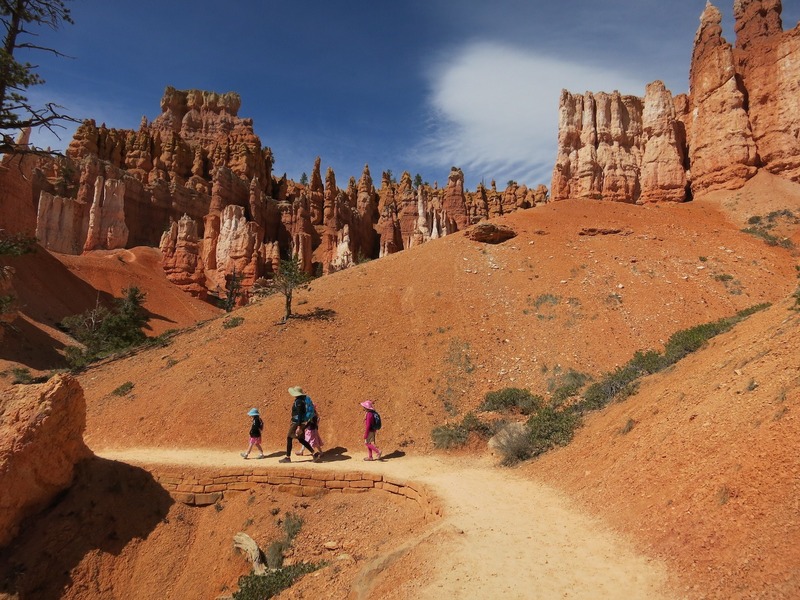 Bryce Canyon trails are not for flip-flops, casual shoes, or cowboy boots. Make sure you wear hiking or athletic shoes with lots of good tread. Our kids enjoyed combining the Queens Garden trail with the Navajo Loop (3 mi. loop). Though likely the most popular hike in the park, it offers some pretty great vistas and changing scenery. Peekaboo Loop (4.8 mi. lollipop from Sunset Pt.) is also recommended. Both of these hikes take you down among the hoodoos and into the forested areas below the rim. If you have the legs for it, consider the Fairyland Loop (8 mi. RT), which promises solitude and some of the coolest formations in the park. I should also mention the Rim Trail, which runs along the top of Bryce Canyon and is paved. It’s an easy stroll and wheelchair accessible. Download the park’s official trail maps here. Roadside overlooks– The main road in Bryce Canyon has no fewer than 15 overlooks, but there’s no need to stop at all of them–unless that happens to be your thing, of course. Bryce Point offers the best vista in the park. Rainbow Point is the furthest away, but worth the drive. While there, take a quick jog on the Brisclecone Loop (1 mi.). On your way back to the main area of the park, be sure to visit Natural Bridge (not actually a bridge) and Swamp Canyon (not actually a swamp). Willis Creek– Though not part of Bryce Canyon, and though we didn’t actually visit it, I’m including this destination on Merilee’s recommendation because she nailed it with Mossy Cave. Willis Creek canyon is a casual day hike (2.2 mi.) in a sandy wash with several narrows along the route. To get there, head 2.9 miles south of Cannonville on Cottonwood Rd. Turn right at Skutumpah Rd. and continue 6 miles to Willis Creek. Take the usual precautions pertaining to canyons like these: bring water, watch the weather, and don’t be dumb. 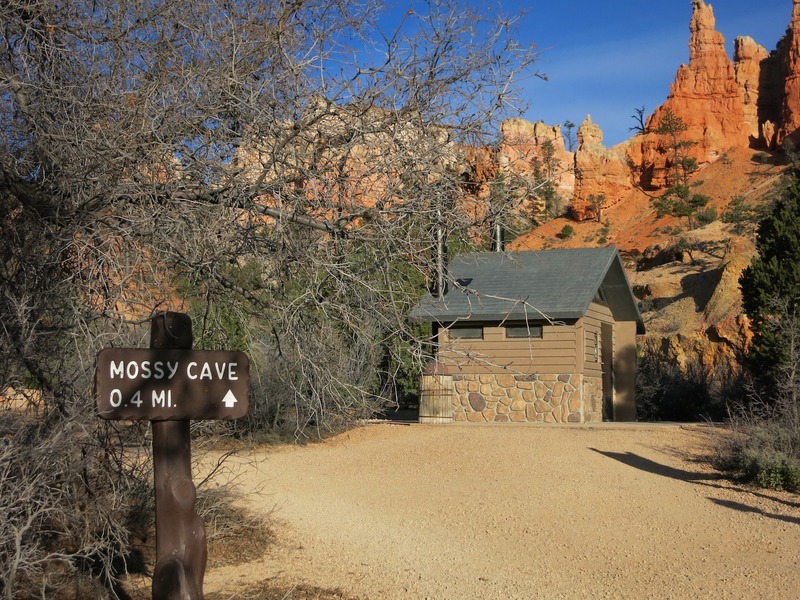 Where to stay: Bryce Canyon has two campgrounds with reservable sites. 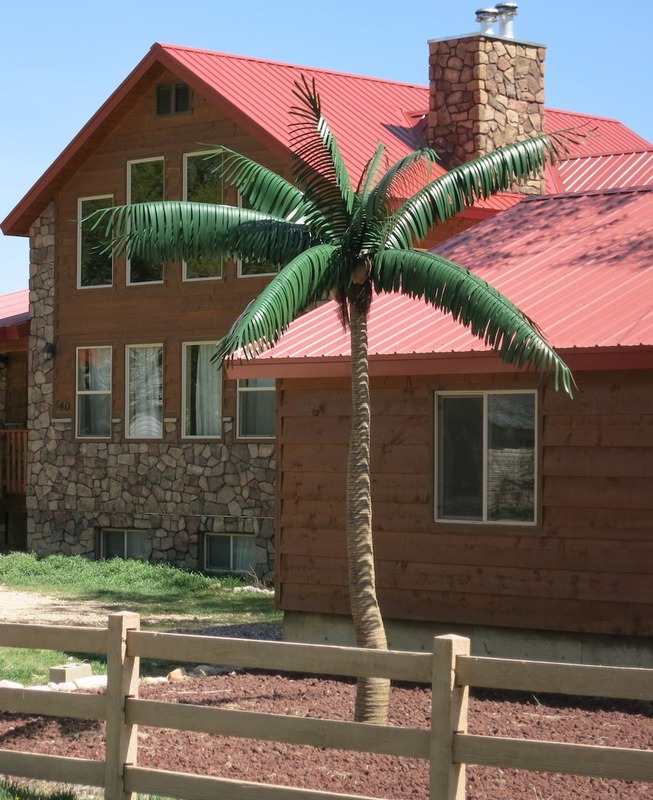 For hotels, Tropic’s Bryce Canyon Inn offers spacious one-bedroom cabins ($119 for two queens) and free breakfast. Merilee and her friendly staff will make your stay a welcome one. I’m not a coffee drinker, but those who are may want to know that the Inn is also the home of Bryce Canyon Coffee Co., which offers fresh baked goods and a ton of different coffee drinks with fancy names. Where to eat: The Pizza Place is right next door to Bryce Canyon Inn. Try McClain’s Favorite Barbeque Chicken Pizza. What can I say? We like pizza. After Bryce Canyon, it’s only 23 miles to Panguitch (pop. 1,507), and the end of Highway 12. This article cannot hope to encapsulate everything. There are just too many things to see, too many things to experience. And I promise you’ll go back. Those of you who read my stuff know my tendency to cover family travel in the outdoors, mostly in Utah. I’ll never claim to be an expert. But who really is? “Expertness” seems more a spectrum of achievement than an outright accomplishment anyway. My only hope is that you find value in my (our) experiences. Even a modicum of inspiration to head out on your own family adventures, regardless of your individual family makeup, would give me no end of pleasure. Junior Ranger swearing in. I was so proud.